Meclizine is a histamine H1 antagonist used in the treatment of motion sickness, vertigo, and nausea during pregnancy and radiation sickness. Tesmilifene is a novel potentiator of chemotherapy which, when added to doxorubicin, achieved an unexpected and very large survival advantage over doxorubicin alone in a randomized trial in advanced breast cancer. Betahistine is a strong affinity histamine H3 receptor antagonist and weak affinity agonist of histamine H1 receptors. Emedastine is a Histamine-1 Receptor Inhibitor. The mechanism of action of emedastine is as a Histamine H1 Receptor Antagonist. Profenamine hydrochloride is an inhibitor of butyrylcholinesterase, antiparkinsonian. It reduces extrapyramidal motor effects and used as an antidyskinetic, characteristic of Parkinson′s disease. It also alleviates thermal hyperalgesia in rats. 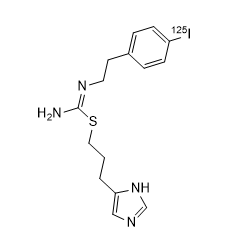 Iodophenpropit is a histamine antagonist which binds selectively to the H3 subtype. Setastine HCl is a potent antagonist of histamine H1-receptor mediated responses. Decloxizine dihydrochloride is a histamine 1 receptor antagonist. Famotidine is a histamine H2-receptor antagonist that inhibits stomach acid production.